This range of cable glands which we offer is made of top graded raw materials and are offered with extra component. These cable glands are used in various cables while connecting them with the devices. With brass coating, these cables are highly demanded due to their optimum performance, superior quality and economic price. We are engaged in manufacturing & supplying BW Cable Gland-3 Part which are made of superior quality raw materials and are available with an extra component. 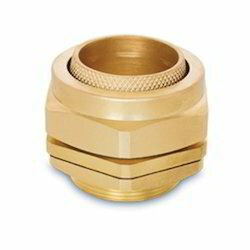 This prevents rotation of the wire and is used instead of a knurled cone. These glands are enabled with various extensive features which results in optimum performance, superior quality and cost competency. Looking for BW Cable Gland - 3 Part ?